This loaded baked potato soup is so easy to make, and you can easily double or triple the batches so that you can have lots of leftovers. It works great on the stove top, or even in the crock pot on low. We love to add this to our soup rotation all year long, too. It’s quite versatile as well. You can bake some potatoes just for this recipe, or you can use leftover baked potatoes. They work out the same way, and if you bake a bunch at once, will save you time. For a vegetarian option, you can easily leave out the bacon. We like to use turkey or even beef bacon since we don’t eat pork in our home, but use what you have. For a dairy free option, simply leave out the cheese and replace the milk with coconut milk. It won’t be quite as thick without the cheese, but it’s still quite delicious. Loaded with creamy potatoes, rich cheese, and the crunch of turkey bacon, this soup is satisfying and comforting! Start by baking the potatoes at 400° for 45 minutes, until knife is easily inserted in center. Remove from oven, and allow to cool. Chop the potatoes into cubes and set aside. Cut the bacon into lardons (large strips) and sautee in a pan until crisp. Remove from pan, and add the butter to any drippings left behind. Sautee the onion and garlic in the butter until golden. Add the flour and form a roux paste. Slowly, pour the milk in while you are stirring to avoid lumps. Heat the sauce over medium high heat until thickened. Add 1 cup cheddar cheese, and 1/2 cup m.j. cheese, and most of the chives and stir until melted. Add the potato cubes and gently mix and heat through. Will you try this soup tonight? 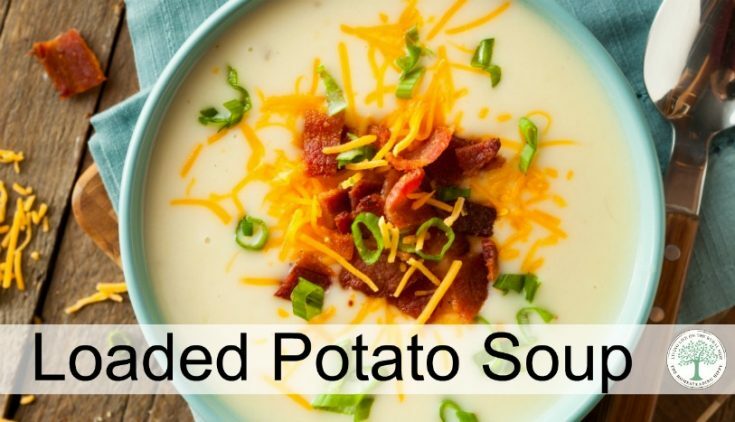 I LOVE potato soup and this one sounds super tasty! OMG! This soup looks amazing Heather! Definitely need to make this one for the family this Winter!